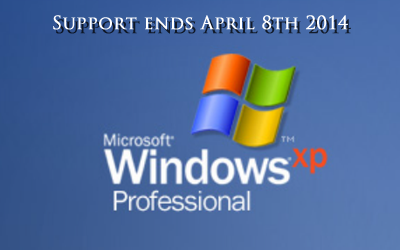 Microsoft announced that they will be ending support for Windows XP and Office 2003 on the 8th of April 2014. So what does this mean for PC users running Windows XP? This means that there will be no updates and no support for Windows XP either online or by phone. When Microsoft stops the updates for Windows XP, it will make the operating system more vulnerable to virus attacks and other technical issues. So, it will be wise to start making plans to upgrade your system. If you are a small business see the section below on what you need to do before you upgrade to Windows 7 or Windows 8. If you are still using Windows XP you basically have 3 options. The first option will be to upgrade your operating system to Windows 7. To do this, you will have to make sure that your current hardware setup will be able to support Windows 7. If not, then you will also need to do some hardware upgrades to accommodate the new operating system. There are cost effective ways of doing all this for both home users and small businesses. Consult with your computer expert if you are in doubt of what needs to be done so that you are not caught off guard by these changes. If you are feeling brave, the second option will be to just go and buy a new computer. Only Windows 8 computers are available in stores these days. So unless you get a custom built computer with Windows 7, you might be stuck with Windows 8 or 8.1. Customer feedback has not been favorable with Windows 8. We’ve heard more people talking about switching to Apple since the launch of Windows 8. The fix with Windows 8.1 did not seem to make much of a difference. So, judging from customer feedback, Windows 8 or 8.1 may or may not be your cup of tea especially if you were only used to working on Windows XP. Hopefully Microsoft will listen and come up with a better user friendly operating system than Windows 8/8.1. In the meantime, if you are stuck with Windows 8 you can find some simple Windows 8 tutorials to help simplify things like the one below. The third option will be to get a custom built computer with Windows 7. Custom built computers can be a perfect solution for getting the desired hardware and software configurations that will work for your needs. They work just as well as any brand name computer if made right and all new parts come with at least a one year warranty. I would strongly recommend getting a custom built computer if your current hardware configuration does not meet the Windows 7 requirements. What you need to do Before You Upgrade to Windows 7 or Windows 8. Take an inventory of your most important software. Check with the software vender to see if they have a version of the software that will be compatible with either Windows 7 or 8 as the case may be. For small businesses this means software like your POS program, printer drivers or some other programs you cannot do without. You might even want to start by upgrading one computer while you still have time so that you know what to expect. Keep track of the snags and solutions found during your first upgrade so that you can make the rest as smooth as possible. Check hardware compatibility and requirements. Each operating system has basic hardware requirements that ensure optimum performance. For Windows 7 you can download and use the Windows 7 Upgrade Adviser. For Windows 8, you can find the upgrade assistance tools on the Update to Windows 8.1: FAQ page. Last but not least, make sure you backup all your data files before upgrading your operating system. Windows 7 usually creates a directory called Windows.old in the C: drive. This folder usually has all the user files from the operating system that was there when the upgrade was done. But, if you have data files that cannot be replaced, it is highly recommended to do a full backup first before upgrading your operating system. Can I Still Get On My Windows XP After Support Ends? You should still be able to get on your Windows XP, but bear in mind that the Windows XP will be vulnerable to viruses without Windows updates. Viruses try to target and exploit vulnerabilities found in an operating system or a program. Microsoft’s answer for fixing these vulnerabilities is Windows updates. Without these fixes Windows XP will no longer be a safe operating system to use. That is why it’s not recommended to keep using Windows XP after support ends. Third party software and hardware venders are most likely going to start focusing on other operating systems other than Windows XP. So, it’s better to stay ahead of the game.